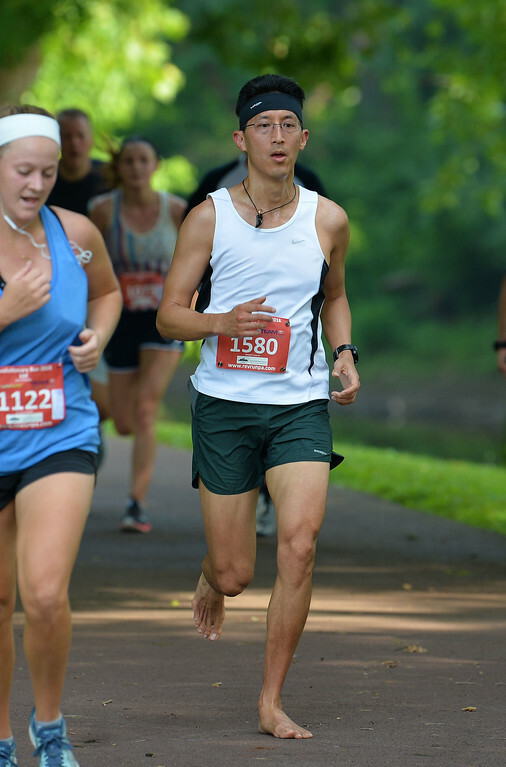 Even an extensive heat wave could not halt the July Fourth running of the 38th annual Revolutionary Run in Washington Crossing Park. 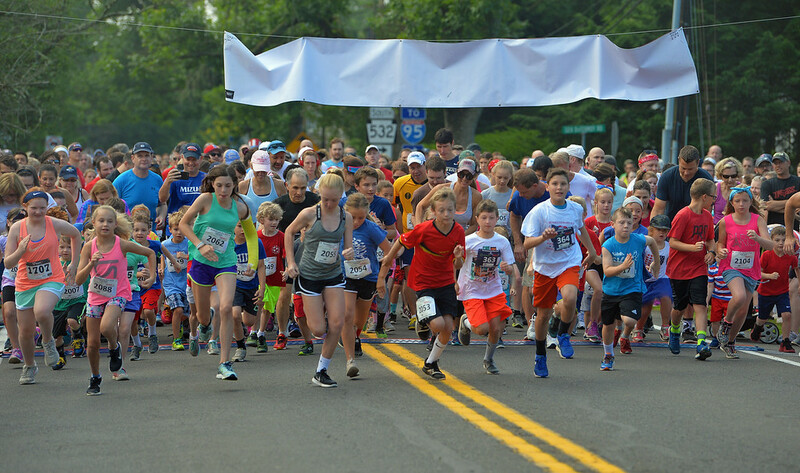 Well over a thousand participants took part in the event that included a one mile fun run, a 5K and a 10K race. The whole affair is steeped in history. 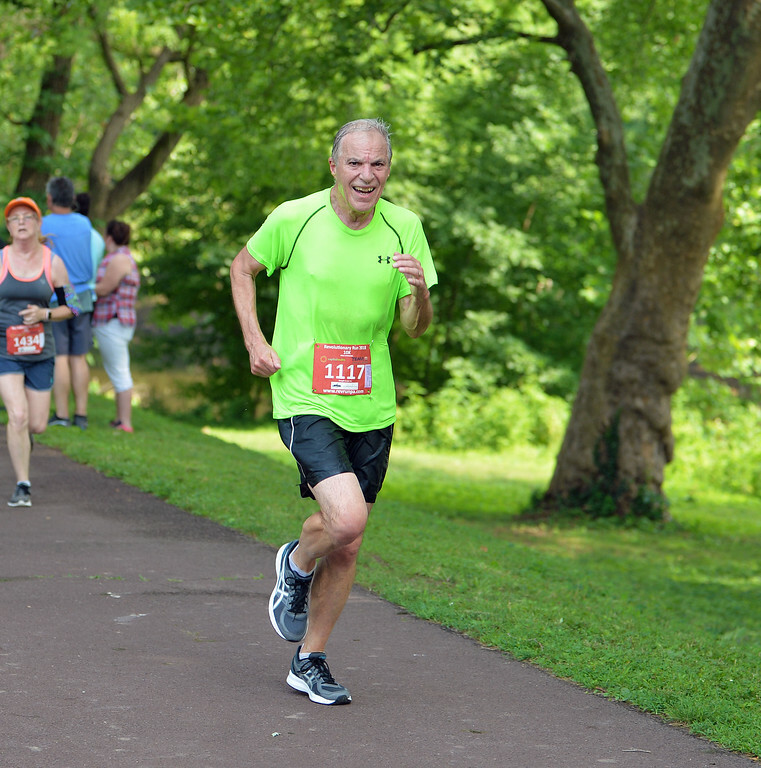 The race started in 1980 as a fund raiser for a local church. The Upper Makefield Business Association was asked to take control in 1999 and have been running the event ever since. 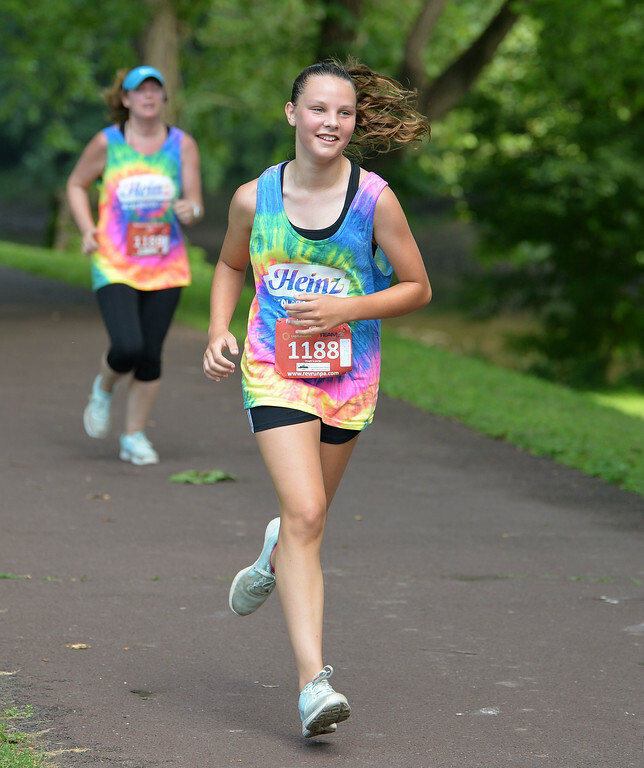 The UMBA uses all proceeds from the race for Township emergency services and college scholarships. 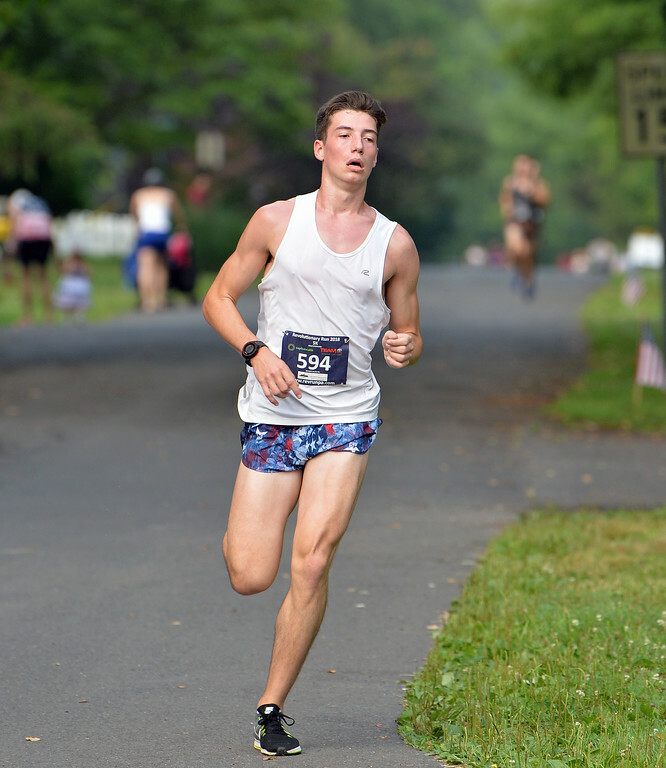 One of this year’s 10K participants, Yardley’s Christian Carabello, typifies the enthusiasm shown by all the runners. “The Revolutionary Run has quite a tradition. It’s always a great event with very strong participation. It draws a lot of people. 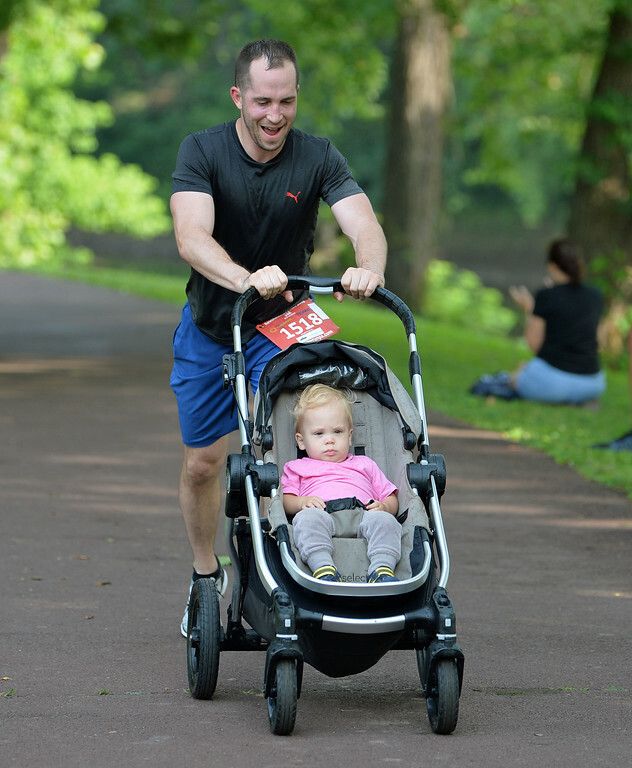 It’s a very friendly event and there are always people watching or cheering you on. 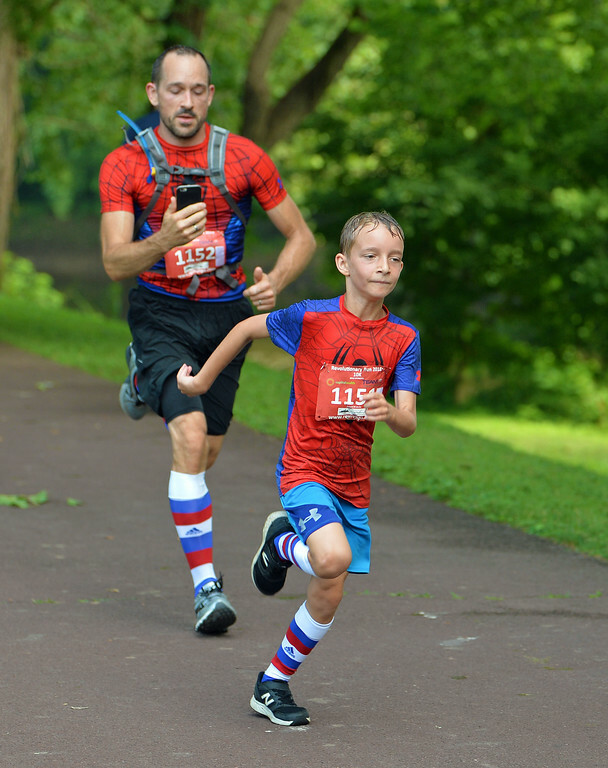 This is the fourth time I’ve done the Revolutionary Run.” Christian started his running career in high school but took time out to raise his own family. “When I had children I kind of put running on the back burner but my children are teenagers now. 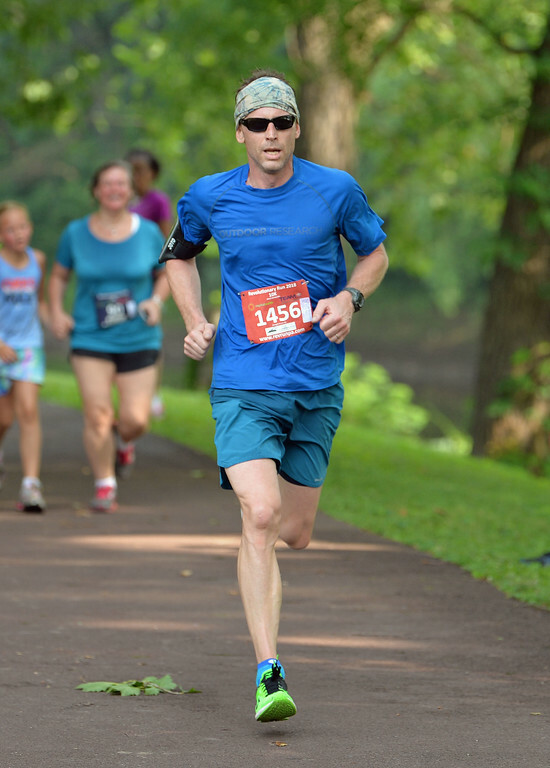 I am 48 now and am running pretty consistently. I did the Boston Marathon this past spring. 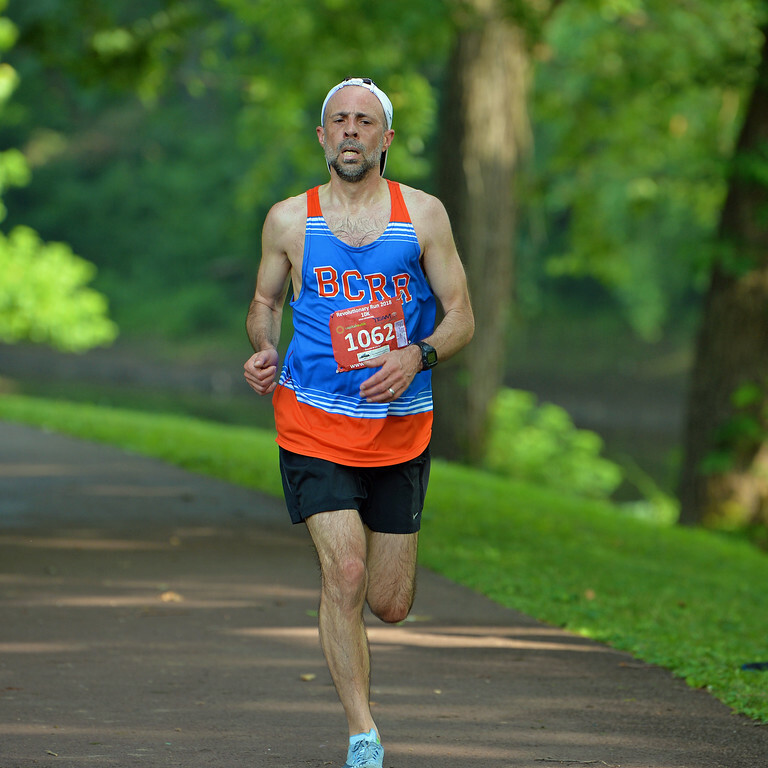 I run a lot with the Bucks County Roadrunners which is a great organization. 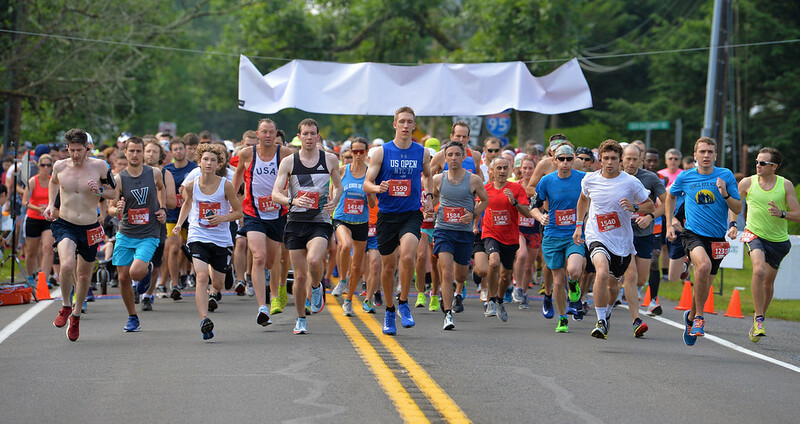 They had tent at the there and a number of their runners participated.” For Christian seeing some his fellow club members only added to the day’s festivities. 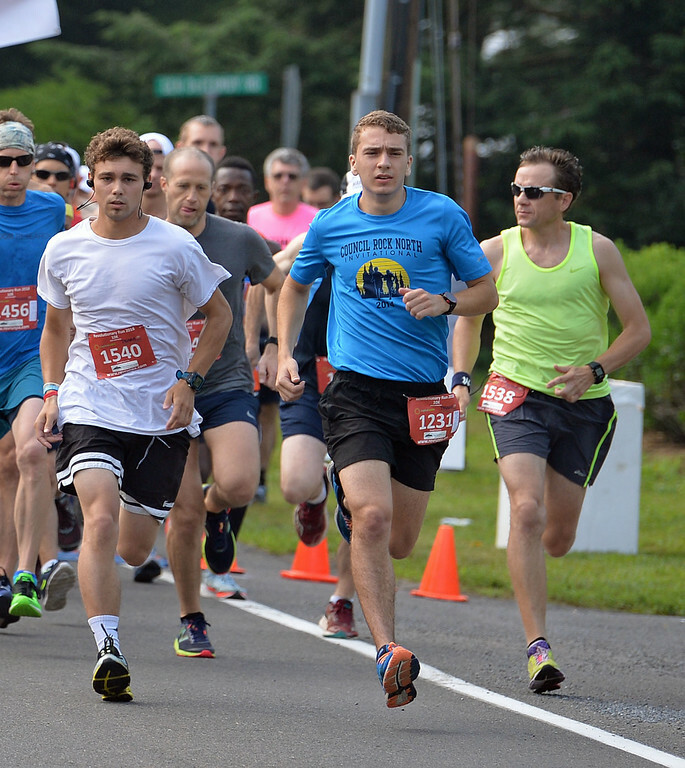 The Roadrunners were just one of the 31 groups sponsoring this year’s race. 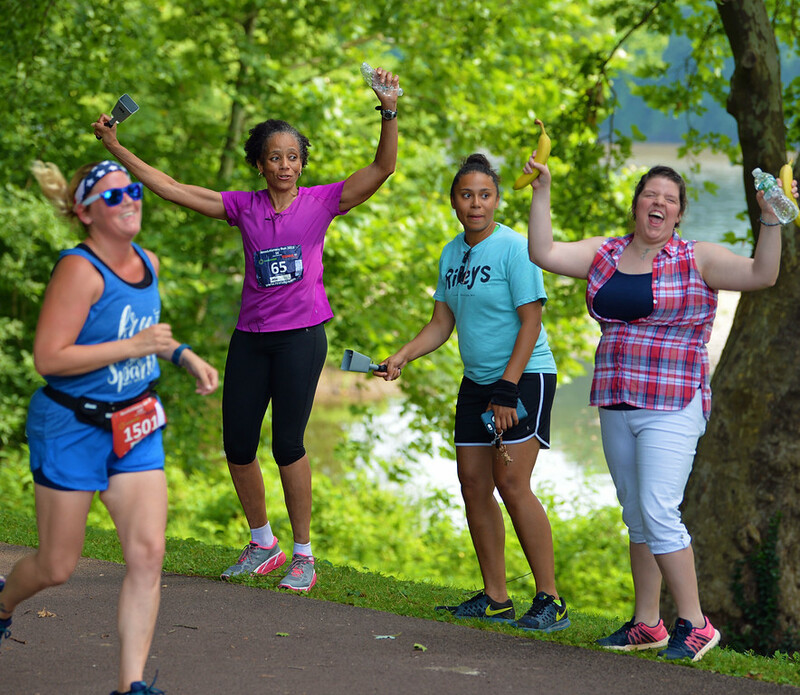 “It’s nice to connect with some of the folks I know from the running club. It’s a pretty big organization. They do the winter series which is a signature event that goes every Sunday in Tyler Park from December through February. They usually get around 350 people. 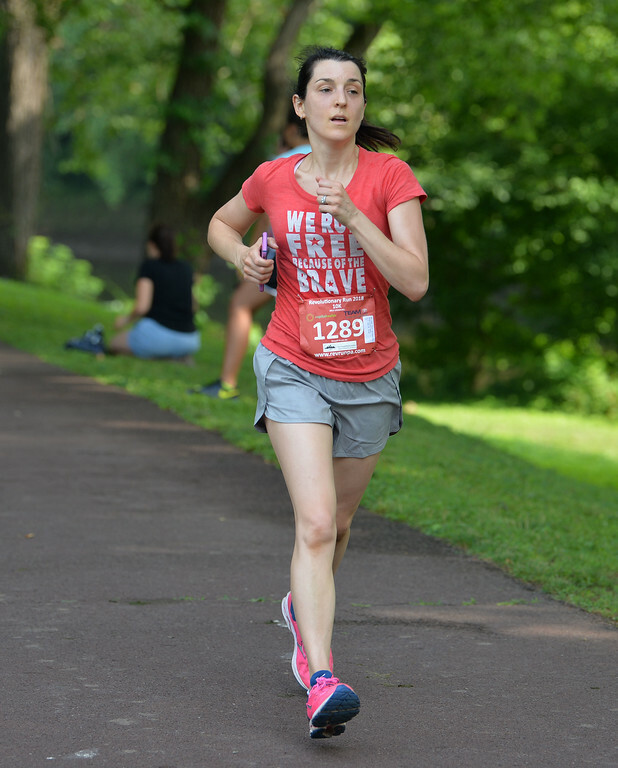 Many of them were at the Revolutionary Run.” This year the Revolutionary Run race organizes added a few new twists to the actual course. 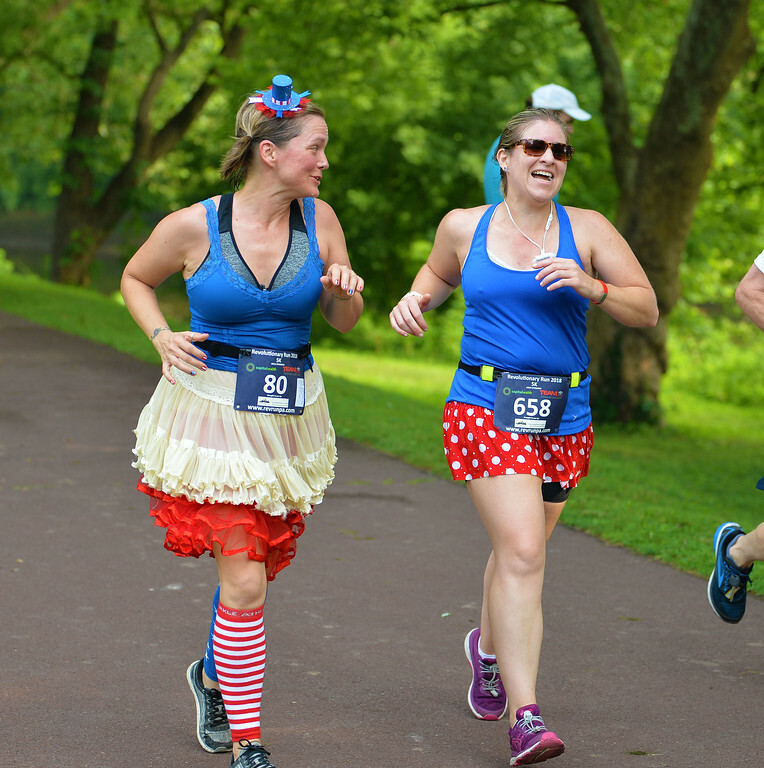 10 K runners wound through the park, proceeded down River Road, did another loop through the park, and then finished in front of the visitor’s center. All three races ended up at the same finish line. Christian always finds the course to his liking. 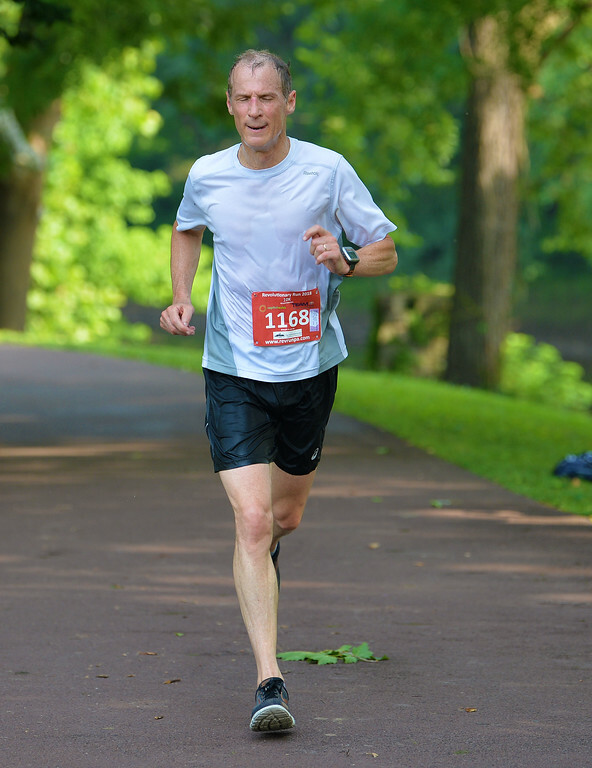 “I always enjoy running in Washington Crossing. 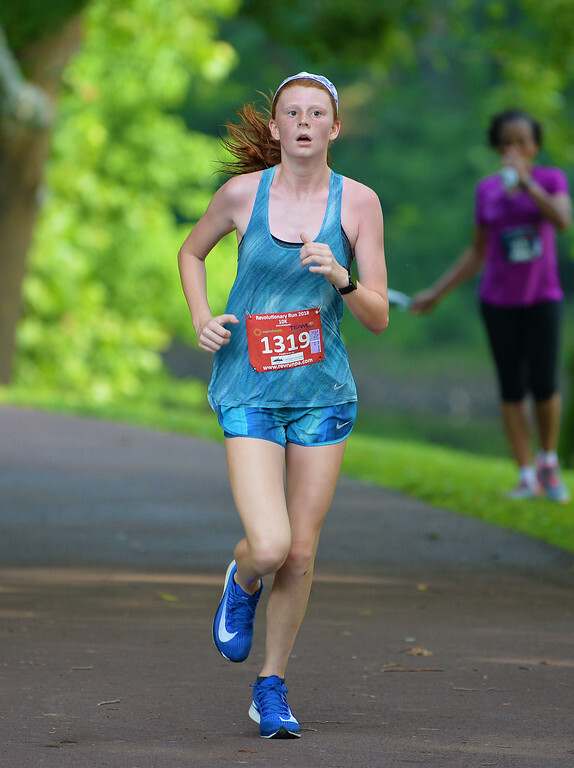 I wouldn’t say it’s a fast course. 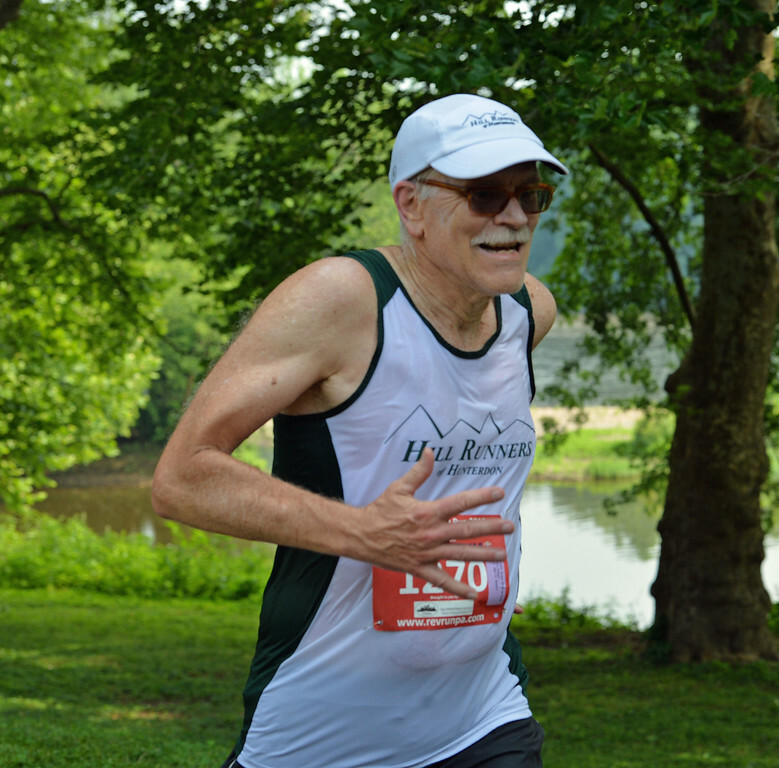 There are some nice rolling hills to make it interesting and give yourself a good workout. It’s a nice course and there’s always a lot of people. 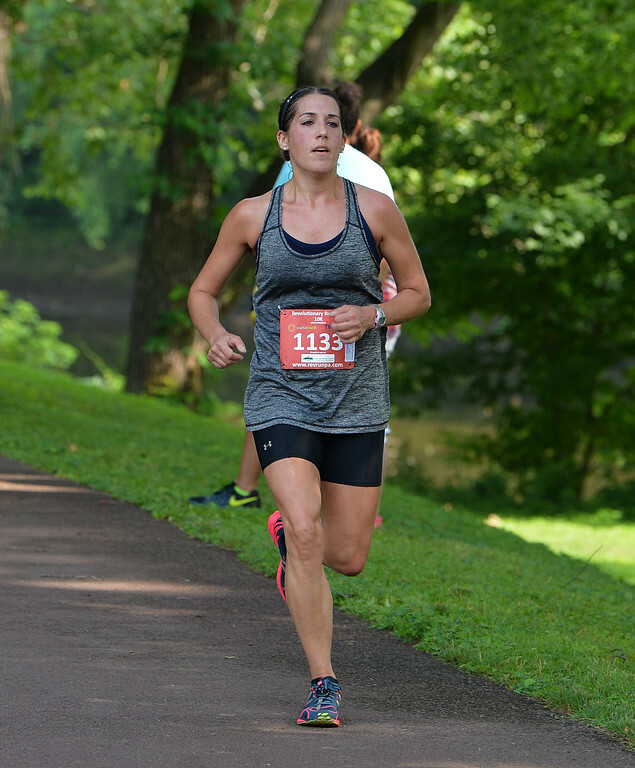 Even if you run fast or slow you always have someone you’re chasing or someone who is chasing you.” Race organizers anticipated the scorching heat and made ample provisions. “They had sufficient water spots and a place where they were spraying a hose which was nice and needed yesterday (July 4th). It made it move along but didn’t take away much of the pain because it was a tough day out there. 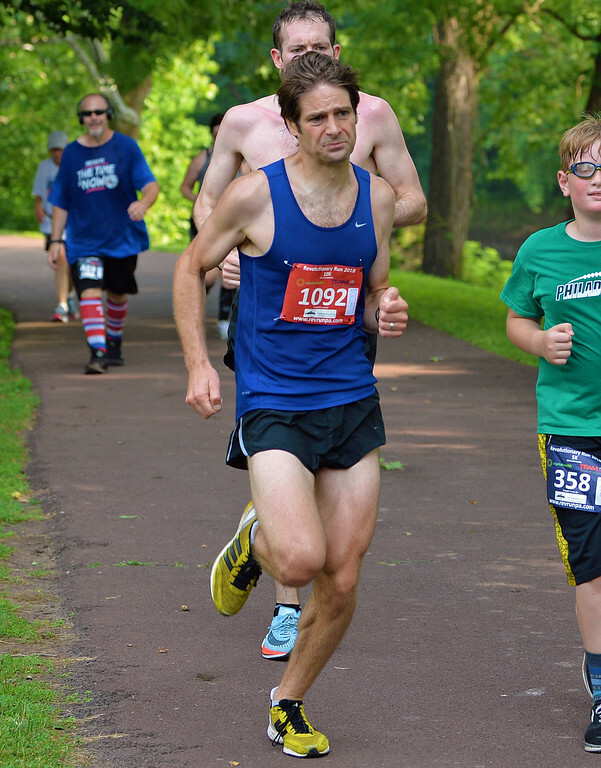 It’s the fourth time I’ve done the Revolutionary Run and typically the heat slows you down.” Christian completed the course in a time of 41:01.60, good for a twenty-eight place finish. 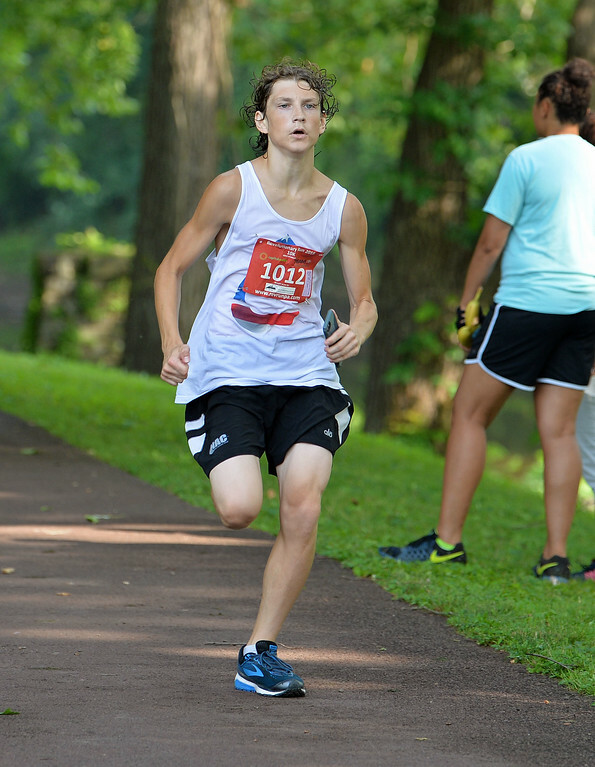 Lambertville’s Chris Curto won overall honors cruising to a time of 36:15.29. 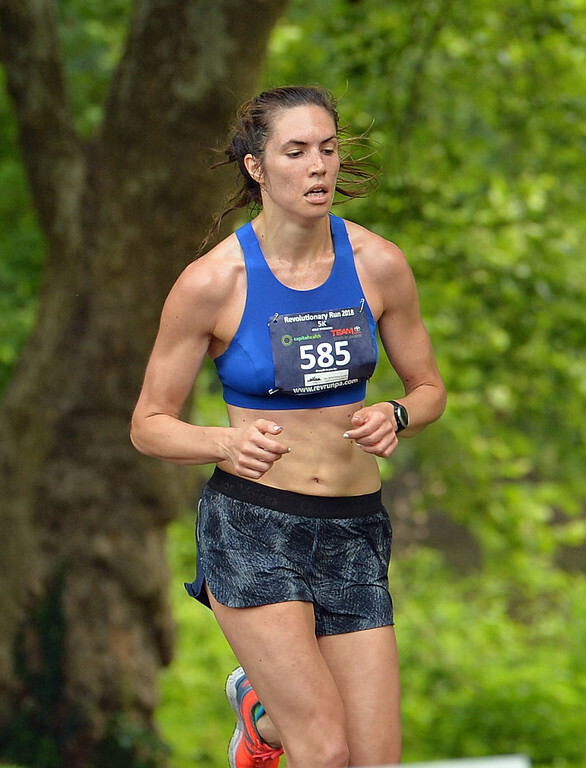 Warrington’s Tracy Sawyer was the top female finisher crossing the line in a time of 38:57.15. 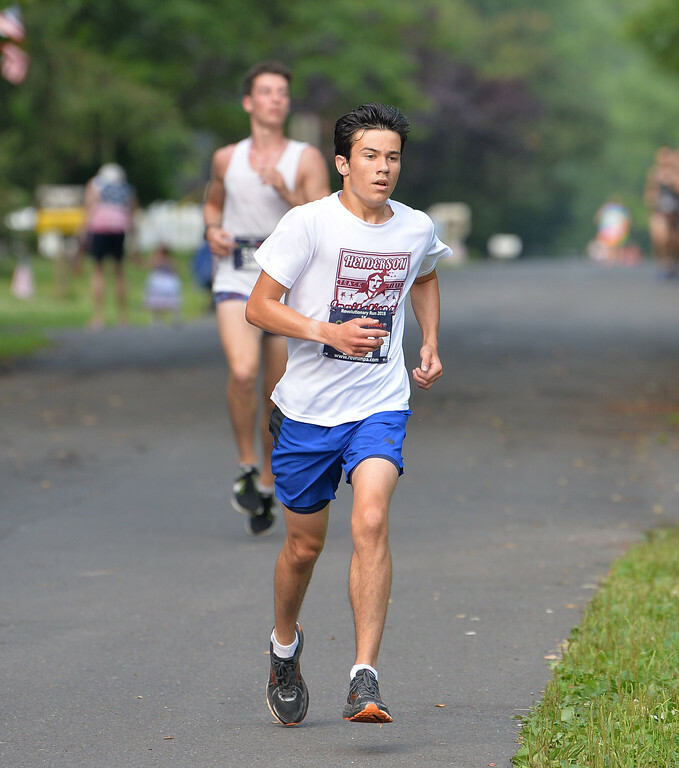 In the 5K race Ringoe’s Chris Testa claimed first place honors. 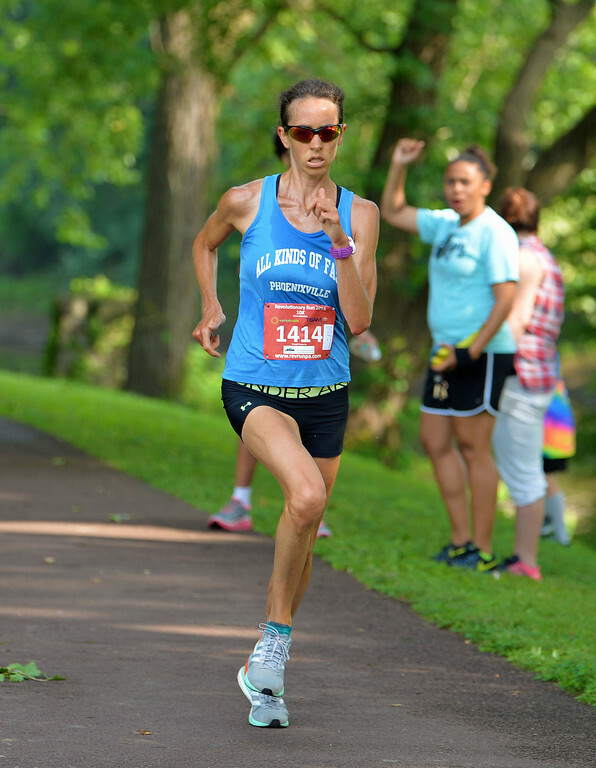 Lawrenceville’s Adrienne Viola was the first female finisher. Regardless of where they placed, Christian felt everyone came out a winner. “You have different courses for different ability levels. 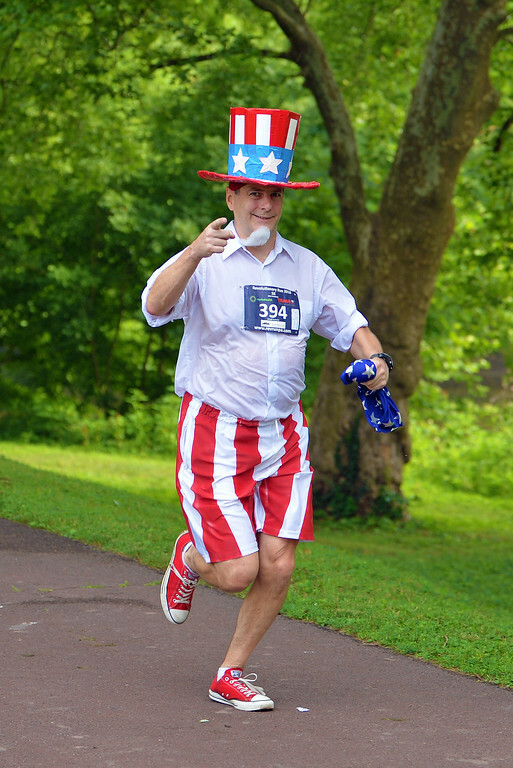 Being a holiday it’s just nice to get out first thing in the morning and get a hard workout in before the afternoon when you do the other activities you enjoy doing on the fourth. 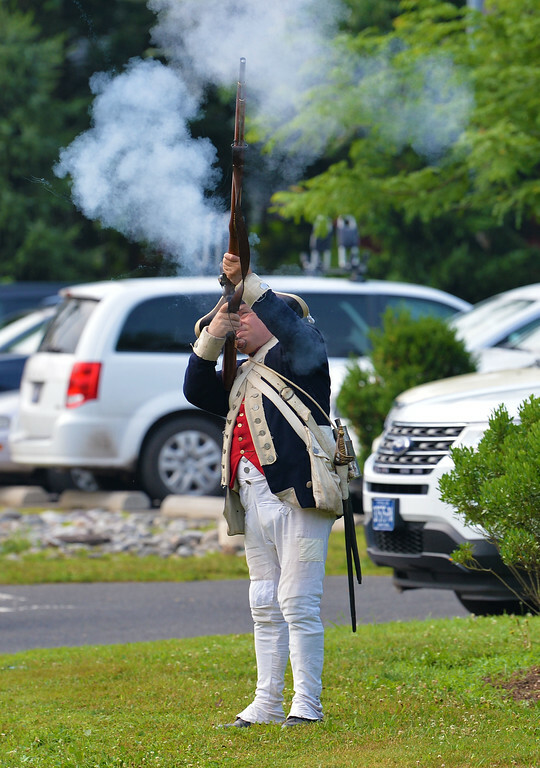 You feel you’ve earned whatever food and beverage you’re involved in later in the day.” Everyone attending the July Fourth affair undoubtedly shared Christian’s sentiments. The Revolutionary Run is a great way to start a holiday.